I mentioned in this space a few weeks ago the IMF’s calculation that China will become the planet’s leading economic power by the year 2016. And I added that, if that proves correct, it means the fellow elected next November will be the last president of the United States to preside over the world’s dominant economy. I thought that line might catch on. After all, we’re always told that every election is the most critical consequential watershed election of all time, but this one actually would be: For the first time since Grover Cleveland’s first term, America would be electing a global also-ran. But there’s not a lot of sense of America’s looming date with destiny in these presidential debates.... On Thursday night, there was a question on gays in the military but none on the accelerating European debt crisis. It's a small matter. If the world as we know it does end, all the gays will be involved in the war. Today I took the motorcycle up into North Carolina, across the rim of NC 106 toward Highland, and then down into the National Forest near Rabun Bald. Forest Service Road 7 runs several miles through pure wilderness in northeast Georgia near the Bartram Trail. It's a rugged road, and it was an adventure getting down it on a motorcycle. The last time I was on this road it was covered in snow, although I believe it was March or April. We were in the truck, and came across a place where the road was blocked by a fallen tulip or maple tree. I had a good Bowie knife, though, so I quickly cut the tree apart and we were on our way. Well, today I had to do that again, only this time it was a red oak! Fortunately, after I was about halfway through the tree and into the heart wood, a Ford F-350 came up the road from the other direction. The two guys were older gentlemen revisiting a favorite camping spot from their youth. They had been horse packers back then, and would ride into the wilderness for a week at a time: but lately there are many more restrictions placed on horses in the national forest. Anyway, they had a big truck and a good rope, whereas I had only a motorcycle. They put a rope on the tree and broke it where I'd cut it -- it was too big to simply pull out of the way -- and then the three of us pushed it off the road in the two pieces. That saved me a good deal of time! I also saw a fellow with a two-mule team moving the remains of a front-end loader, which I suppose didn't survive the mountains. The mules did all right, though. A couple of those mammoth jack mules can move just about anything you're likely to be inclined to move. Mrs. Grim ran off with the camera this weekend, so I don't have any pictures for you. Here's some music instead. How about some bagpipes in honor of the soon-coming Stone Mountain Scottish Highland Games? Or one more, since I ran across a rendition of "Scotland the Brave" on this very trip. Lately, I keep roaming around my familiar haunts with different cameras, setting myself ridiculous tests or trying out different lenses, simply to distract myself. As if one could frame the same reality and somehow change it. As if capturing a rose in bloom might preserve it, like something caught in amber. Forever on display. Either that or rot and decay. Everything hurtling to destruction, and so I snap from the careening car that beautiful view, that bird, that pair climbing the hill. The beauty we must not miss. What if the rose is in no danger? There is a school of metaphysics, whose claims are suggested by Einstein's special relativity theory, that holds that each of us exists as an object extended in four dimensions: the three you know, and time. Thus the rose exists as a kind of line, that begins the moment it takes on existence as an independent object -- say, the moment at which its genetic code is set, so that it is a new and distinct object with its own structure. The line, widening as the rose grows, extends to the moment that the rose dies. Because this object contains all the time during which the rose exists, the object itself is static and unchanging. If you saw the rose in bloom, it is because your object snakes close enough to the rose, at a particular point upon the rose-object when the rose was in full bloom. If your object turns away from it, then, and goes home, it can snake back in the direction of the rose in a month or a year, and find it gone or rotting; and so you think the rose is lost. But the bloom is not lost. It is there, in the object, now as forever. Nothing is lost, not ever. So this school holds, at least. Walt Harrington is a reporter who knew the former President for a long time. How long? In Midland all those years ago, the normal distance between prominent source and reporter didn’t apply, and W. invited me out to a Mexican restaurant with Laura and their four-year-old twin daughters, who got in trouble for throwing chips, were threatened with a spanking, and went home without dessert. He stopped in recently to see his old friend, and report on how he's doing. Twenty-five years later, George W. Bush looks great. Two years as a civilian have been good to him. His feet clad in golf shoes and up on his desk, he leans back in his chair, a well-mouthed, unlit cigar as a prop. At 7:45 A.M., he’s talking golf. Golf is a fine pastime for a retired President. Rep. Bachmann doesn't make his summation at all, which is sadly appropriate. She did very well in the early phase, but given her unfortunate performance over the vaccine issue this week, in which she has taken the time I wished to give her to first double down on the assertion, and then to deny responsibility for the claim -- she was only passing on the word of a distraught mother -- I suppose I can no longer support her candidacy. She is a good woman, I am sure, but she does not have the quality of command. The long campaigns have the benefit of showing such flaws in time for us to make an informed decision. Unfortunately, at this time there is no clear choice to whom I might transfer my support. When I stop to think about whom I might want to be President -- if I could choose anyone at all -- I can think of no one. Certainly I do not see anyone to support among the frontrunners of our two parties: but I can think of no one at all. The office is so heavy that I know no one who could bear it. I don't want another President, not any other one. Not until the office is smaller, better fit for a man or a woman. A good reason to support Rep. Bachmann was that she seemed to understand the importance of sliding the power out of the Federal government, and letting it fall to the states or back to the People. That is the one big idea that we need to advance. Who shall carry it? While we are talking about the death penalty, you should read this piece by Steve Earle. The guilt of the accused is not in doubt in this case: he brutally killed two women and nearly one man, the last of whom lost an eye in the attack. What follows is a story of redemption and death. Georgia carried out the execution we discussed the other day; I've been thinking about it a great deal. The Atlantic has a long piece on the philosophical underpinnings of the death penalty in America, which may be worth reading. There is no compelling reason to believe that Troy Davis was innocent, as is being attested so strongly by so many today. He fled Savannah on the date of the crime; and the gun he allegedly used to shoot off-duty officer McPhail was supposed to be the same gun he had used to shoot another man in the face earlier that night. His membership in the crowd of people who might shoot someone in the face -- that is, his gangsterism -- is not in dispute. He begged the jury, on conviction, for "another chance," which is not suggestive of innocence. Seven of the nine eye-witnesses recanted their testimony after the trial; but on the other hand, it is to their benefit in street culture to say they were pressured by police to testify versus standing up for having helped the law convict. One of the non-recanting witnesses allegedly boasts about having been the real killer; but again, in the culture we're talking about, such boasting has a demonstrable benefit. It raises your stature. Since there's no danger of prosecution -- the case is cleared by arrest and conviction -- why not boast? There's benefit but no cost. There are a couple of things that are suggestive, though. One that may be unconvincing to many is Mr. Davis' refusal of a final meal or a prayer: he seems to have been convinced that things would work out for him, which suggests a strong faith. One that may be more convincing to most is that no .38 caliber pistol was ever found to link to Mr. Davis; whereas the braggart admitted to having one in his possession at the time of the crime. Oddly, it was not produced for ballistics testing. Why not? Ultimately it may well be the case that my state, Georgia, has just executed an innocent man. It may also be that he was guilty. We do not know. The lawful process was followed with complete thoroughness; all the safeguards tested, but in the end they did not serve to stop a questionable killing. I've been spending a fair amount of time rereading John Locke, who (like Kant!) is a big fan of capital punishment. I begin to doubt that our system of government is legitimate enough to carry out an execution; at least, I think it is not legitimate enough in cases when a person has not explicitly accepted the social contract. For a traitor, who has sworn an oath and breaks it? Yes. But for someone who has never agreed to be governed? It will not do to say, as Socrates did, that they have accepted the benefits and are therefore bound as slaves to the state; that cannot hold in an era in which you are no longer free to move to, and live in, another country without explicit permission in the form of a visa. To say that you are bound by the contract whether you consent or not is to say that it is not a contract. It is an imposition by force, which by our tradition means that it is no contract at all. Mr. Davis, at the age of twenty, clearly did not accept the contract: he was a gangster, part of a society that explicitly rejects the law. Perhaps he accepted the contract with the necessary explicitness when he surrendered to the police without a fight, accepting his life in exchange for the wager of trial and conviction. To kill a fighting enemy is fair and honest; to kill a prisoner helpless is a morally dangerous act. Better for him to have died twenty years ago with a gun in his hand: better for him and for us. Instead he surrendered to our justice, and now we have given what we have of it to offer: binding a man with chains, and then poisoning him while he cannot resist. The skipper of this sloop is a man of skill and prowess at his craft. These gentlemen, on the other hand, show room for improvement. Historians are now suggesting that the Civil War killed a lot more people than we had previously understood. Relying on census data, they posit a new figure of at least three quarters of a million people, and perhaps 850,000. What does that mean in terms of the trauma to the civilization? For purposes of comparison, consider that less than 1% of Americans of military age have even fought in the Iraq war. * A conflict that approached the Civil War would have resulted if everyone who served in Iraq had died there; and then nine times as many more were sent, and they also all died there. Are such conflicts behind us? ZenPundit, who has been writing about the "Responsibility to Protect" (R2P) doctrine being promulgated at the UN by Anne Marie Slaughter and the Obama administration, warns that the doctrine is deadly on its face. Finally, while boldly rejecting international law’s long established definition of sovereignty, Slaughter offers two easily falsifiable assertions, that states can no longer govern effectively by governing alone and that the ever present danger of arbitrary meddling by foreigners is a prerequisite for good governance. If so, Switzerland would be a Hobbesian hellhole today and Central America and the Caribbean islands would resemble tropical Singapores . The omnipresent threat of foreign meddling on religious grounds is what states ran away from screaming after the Thirty Year’s War, which may have killed up to a third of all the people in the Germanies. "A third of all the people in the Germanies" is of course not 10%, but 33%. Surely we are too wise for that, though; wars where millions died for an ideology where surely left behind with the 20th century. Weren't they? * The exact figures on how many served in Iraq appear to run between one and one and a half million; there are more than two hundred million Americans of military age, if we take military age to be 18-65 (which we should, as several of our general officers have served in Iraq past the age of sixty). Note that we move from "white men" to "Americans" because (a) the demographic composition of American society has changed so substantially since 1860 that we could only sustain anything like a comparative figure by expanding "white" so that the category meant simply "not black"; but even then (b) black Americans are a disproportionately large part of our military forces, meaning that we still wouldn't get a reasonable comparison. For a similar reason, note the move away from "men." However, note that the "less than one percent" can be read as "only about one percent" even if you restrict the sample to "American men of military age," of whom there are slightly more than 100 million. "In a move without precedent in the modern era, Republican congressional leaders... have penned a letter" to the Fed. The shocking thing here, surely, is that no one ever did it before. Although the Fed's board of governors are appointed by the President, the Fed is not technically a part of the US Government, but it controls our money supply and -- in important ways -- the dollar itself. Printing money is a Constitutional function of the Congress, but actually printing money isn't the way that the money supply is manipulated most of the time now; mostly it is done via actions like the Fed's "Quantitative Easing," in which purely notional transactions between banks "reduce" or "expand" the money supply. The Congress has granted the Fed authority to manipulate the money supply in that way, and so Congress has in a sense delegated its Constitutional duty to the Fed. Since the Fed's authority is derived from Congress' authority to print money, why wouldn't Congressional leadership send a letter to the Fed telling the Fed what it thinks about the money supply? It's Congress' authority that is being used here, after all. Even if we have decided to delegate that authority to an independent board, Congressional leadership surely has a legitimate power to send a letter voicing an opinion as to how Congress' delegate authority should be used. The song is a cheery one in French, though an old and traditional. Here is one that is newly composed, within the last dozen years or so, but in a dialect of French that is genuinely Medieval. Of course, most likely you will want to see the modern France, and not the one that would interest me. You'll have to let us know what you find there of value. It sounds as though we may have profited from Mr. Huntsman's attempt at the Presidency, after all. About a month after his arrival in Beijing to take up his new post as United States ambassador to China, former commerce secretary Gary Locke has aroused wide public attention, curiosity and controversy with his seemingly simple lifestyle and people-friendly posture. Locke, the first Chinese-American to become US ambassador to China, arrived in Beijing in economy class on August 12. Television footage showed a leisurely dressed Locke walking out of the airport with a backpack, like a backpacker tourist in every way. Then a Chinese tourist posted a photo on the Internet showing Locke sporting a small backpack and buying his own coffee at Seattle airport's Starbucks. These scenes immediately created a buzz among Chinese netizens. It was hard for them to imagine Chinese officials doing such things. Even the New Left, who are critical of capitalism and against China becoming "Westernized", praised Locke. On Utopia, a major website of the New Left, a commentary said, "Compatriot Locke, hypocritical as his acts may be, is however giving a good lesson to our cadres on how not to cut themselves off from the masses." Yesterday, Ambassador Gary Locke flew back to Beijing on our flight. Not only did he reject attempts by our ground staff to give him special VIP treatment, he also rejected an upgrade to first class as well as the coach on arrival. In economy class, Locke remained polite and unassuming throughout the entire journey, while another customer in first class began making demands as soon as he boarded the flight. What a stark difference. Well! That's refreshing: not merely a diplomat who is diplomatic, but an American public official who knows how to fly economy class with courtesy. It's not just the CCP -- American officials could benefit from the strength of the example. Based on the general commentary, I've restored the Blogger standard comments -- which, oddly enough, are very much like the old Haloscan comments. Hopefully someday I'll be able to restore the old discussions, which I have saved as a database for now. Thank you for your patience during this annoying hassle imposed upon us without our consent. A hymn from Georgia's own late, great Jerry Reed, complete with shotgun and straight razor. The argument, familiar to bikers, is now being made about electric and hybrid cars. Of course, since (as Glenn Reynolds points out) a car is far more deadly to other people on the highway than any motorcycle, the lives being saved are no longer the owner of the "loud" engine, but the bicyclists or joggers. Lots of bicyclists and joggers, too. The most important feature of this Hall is the community. For that reason, I'm interested in making sure that it is easy for you to comment, so that you will comment more often. I've heard from Mr. Hines that he's having some trouble with the Disqus business; and Elise didn't like it compared to Blogger's general comment system. In addition to that, it seems to be taking extra time to load the page, which is annoying for me. I had heard that Disqus could restore the old comments from Haloscan/Echo, but so far I haven't been able to get that to work. What do you think? Should we abandon the effort, and go to the Blogger comments on the ground that they are simpler and load faster? If I do that, would you prefer a pop-up comments window, or a Disqus-style? Not a bad bit of origami, I'd say. I have been absent, struggling with the sudden catastrophic illness of a dear aunt just as I prepare to travel to France with my sister, our first trip together as adults and my first crossing of the Atlantic. For about two hours, the bad guys seemed to have invented an unstoppable new strategic weapon, with who knew what dire long term consequences, but then it proved they were stoppable by unarmed frequent flyers. And there haven’t been any kamikaze hijackings since Flight 93. Just 109 minutes after a new form of terrorism -- the most deadly yet invented -- came into use, it was rendered, if not obsolete, at least decidedly less effective. Deconstructed, unengineered, thwarted, and put into the dust bin of history. By Americans. In 109 minutes. I have not been called on to save anyone's life this month. I have only been asked to find a way to intervene in the intolerable suffering of a 95-year-old woman who was being ground up in a shocking medical and legal system. I have resurfaced in the world of internet commentary that normally is such an important part of my daily life to find that Grim has written several indispensable posts about how we exert ourselves to act properly. Every day someone involved in my aunt's care has the power to propel either her or me (or both of us) into the depths of extravagant misery or onto the summits of consolation and peace. What happens to us can be important, but how we act is everything. "Inasmuch as you did it unto one of the least of these My brethren, you did it unto Me." A doctor took my aunt's hand, looked into her eyes, and offered her a heartfelt apology for letting her down, before prescribing her the morphine she needed. That doctor turned our lives around in an instant by opening her eyes and doing her duty, when institutional inertia and burnt-out fatalism from family members entrusted with my aunt's well-being might have led the doctor to turn her back. Every moment is a choice. 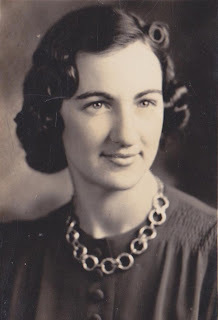 Here is my aunt at the age of 26 in 1941. She came of age in the Depression. She is not a drug-seeking whiner. She is not simply looking for attention. She did not bring this suffering on herself by refusing surgery that probably would have killed her. She is now in the hands of people who can help her. My aunt may be with us for some months yet; her remaining time is a gift she can spend putting her affairs in order, rather than the sentence of torture that it was.